The bi-weekly shipping schedule DC’s implemented for some of its top books has been a benefit to the speed of the narrative, but it’s been more problematic when it comes to the artwork. While some titles have found elegant solutions to this problem, others have worked their way through fill-in artists almost haphazardly. The Flash, unfortunately, is one of the latter, and issue 29 is especially egregious in that regard. Artists Pop Mhan and Christian Duce each illustrate half of this issue (which artist worked on which pages is never specified), and their styles couldn’t clash more. There’s something gritty and angular to the first half, while the art in the second is clean and slick; even the coloring of each is worlds apart, despite Hi-Fi coloring the entire issue themselves. At least their pages aren’t randomly assigned and mixed — that would have killed the issue entirely — but there’s still something frustratingly jarring about the whole process, especially knowing that it all stems from a shipping schedule that artists simply can’t keep up with. This split also emphasizes another weakness of the issue — Joshua Williamson’s narrative is similarly fragmented. 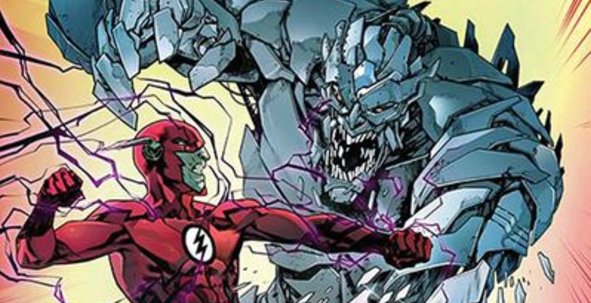 The first half of this issue mostly focuses on the battle between the Flash and Shrapnel and the aftermath, while the latter half pivots its focus to Barry’s internal-scandal investigation at CCPD. While it’s possible that these threads could converge later, for the moment this arc is feeling a little scattered, and this issue like it’s just trying to get from one-plot point to another, table-setting rather than telling one self-contained part of the larger story. The one idea that consistently runs throughout the entire issue — and, ultimately, keeps it afloat — is Barry’s struggle to essentially relearn how to live his life without his superpowers, now that the Negative Speed Force has completely changed how his abilities work. 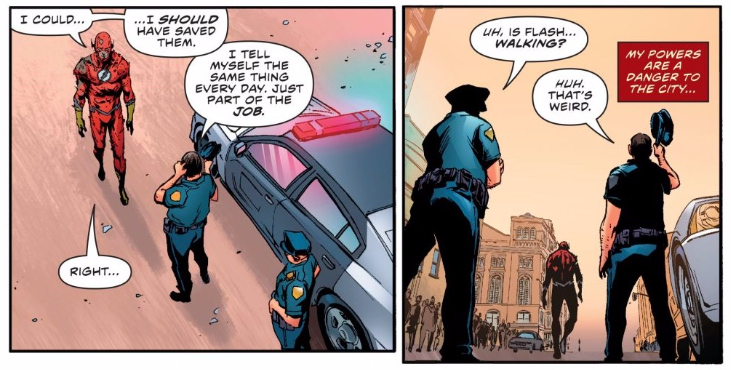 The consequences of Barry being unable to use his super speed are inventive, upsetting, and a strong backbone for this arc. I do hope that everything surrounding this idea, though, become more consistent as the story continues.